Following the success of the netbook concept, even manufacturers not usually associated with laptops are looking to get in on the action. The latest is Nokia with its Booklet 3G. Looking more like a mini Apple MacBook Pro than any of its current netbook rivals, it feels worth every bit of the steep asking price. The chassis is made from a single piece of aluminium and there's no sign at all of flex under pressure. The black plastic on the rear is an acquired taste, however. The keyboard is incredibly sturdy, although the small keys won't suit all users. The rubberised finish is tactile and the isolated style – with each key sticking up through an individual hole in the chassis – sees plenty of space between the keys. With a responsive and comfortable action, this is one of the most impressive keyboards we've yet seen on a netbook. The screen is also very good, with a pin-sharp 1280 x 720-pixel resolution. As a result, there's more than enough space to work with a couple of windows side by side. There was a hazy quality to our preproduction review sample – with images looking slightly smeared – but it's a bright and colourful panel nevertheless. There are plenty of features on offer, including integrated 3G/HSDPA, providing wireless broadband on the go. A-GPS is also in place, along with mapping, and lets you use the Booklet as a sat-nav device. There are three USB ports placed around the chassis and an HDMI port lets you connect to a high-definition (HD) TV or projector. There's also an SD and SIM card reader hidden behind a plastic cover. When it comes to components, the Booklet is standard netbook fare. 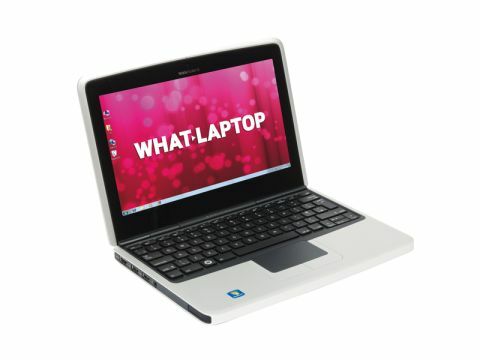 There's an Intel Atom processor running at 1.6GHz and 1024MB of memory powering the Windows 7 operating system. We found it quite sluggish to start-up, but it was fine once up and running. Performance could also change for the full production model. A key feature of this netbook is that Nokia is claiming up to twelve hours of use from the standard battery. Unlike many such claims from laptop manufacturers, this proves to be entirely believable in this case and we managed to get an amazing 679 minutes from a single charge when testing our pre-production sample. Although the price of the Nokia Booklet 3G may take it away from the original 'basic and affordable' ethos of the netbook market - as we went to press, Nokia was trying to tie the price down to £599, but this may rise to £649 - it's still an amazingly good machine. If you place quality above a bargain-basement price, you currently won't find a better netbook on the market, and the all-day battery life greatly adds to its overall appeal.